Well to say that I had been eagerly anticipating this book was a severe understatement, after reading A Beautiful Kind of Love I was hooked. These characters had embedded themselves deep within my soul and I wouldn’t have been happy until I knew what had happened. I must admit, I had been stalking Ellie Wade, begging for her to release the book, I needed it!! 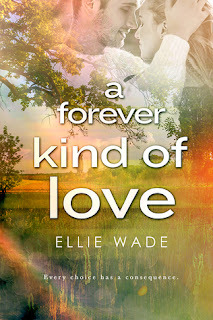 One thing that I am ecstatic about is that Ellie Wade remained true to her characters, I understand the pressure that authors are under to deliver the story that the fans want, but sometimes, the characters have other ideas and after the ending of A Beautiful Kind of Love, I was devastated, it was a car crash. However, the story that Ellie Wade delivered was her characters personified. However hard this book was to read, the actions of her characters throughout this book are what I could see those characters doing and for that I am extremely grateful. Jax was a beautiful character, both inside and out. He always put everyone else first, even if his actions caused pain in the short term. But throughout this story, going back right to the beginning, you could never doubt his connection and his love for Lil. These two were soul mates, they were fated to be together and though the journey to get there has been full of ups and downs, I had faith that the stars would align and finally they would be together. Ellie Wade though was not finished, she wanted to put us through the mill and boy did she succeed. I will say that every tear that fell while reading this book was for Lil. Every. Single. One. This girl was certainly a glutton for punishment but you had to admire her resilience. While Jax didn’t make her life easy for some time and some of his actions had me sobbing, I understood. Jax was broken, badly broken. Everything had finally caught up with him and there is only so much a man can take before the walls come crashing down and when they crashed it was devastating. I loved Lil’s tenacity, most people would have given up, but she kept on going back. While some may think that she was weak, for me this just showed how much she loved him. She believed in them, just like me as a reader. She could see what he wasn’t, she just kept that faint glimmer of hope in anticipation that Jax’s fog would clear and he could finally see their end game. I am purposefully keeping this review vague because this book is high on the angst meter and it needs to be felt first hand. You need to experience the highs and lows, the anger, the disappointment, the heart ache, but round the corner we have plenty of highs. I have seen the term “love triangle” bandied about; this book does not contain cheating. I have even seen the term “second choice,” but that is not what this is at all. Never, ever did I feel that Lil was second choice. Jax was in a situation that his heart and compassion would not let him get out of easily. Anyone that understood Jax would have known what he would have done under the circumstances and he did exactly what I thought and that is where I say kudos to the author, she stayed true to her characters. While I could have happily slapped him, repeatedly punched and kicked him, I understood, just. Yes there are a few scenes in here that made me cringe, but it was more from heart break. Such was the intense character connection I had with these two, when they hurt, I hurt and throughout this book, I hurt, a lot. But at the end I was extremely happy. I knew I had been put through the wringer but I knew that this was real; it reflected real life and real choices. We all want our rainbows and unicorns but sometimes we have to wait to get them and I can say hand on heart, the wait was worth it. My reason for a four star, was in the beginning, we flick back from past to present, I felt some of the past was a bit too repetitive and altered the flow of the story, but other than that, I loved it all, even if it was extremely hard to read. For those that love angst, and are prepared to wait for their HEA and understand that sometimes true love doesn’t run smoothly and life can throw a heck of a lot of curve balls, then you will love it. I did.